Alternatives analysis is at the very heart of the State Environmental Quality Review Act. A state or local government agency cannot claim to have rationally chosen a preferred alternative course of action if other alternative approaches to achieve the same project with fewer environmental impacts have not been evaluated with the same degree of rigor and detail. That’s the law. The eight public hearings about classifying more than 50,000 acres of Adirondack Forest Preserve are winding down this week (final public hearings at Bear Mountain and Albany), and the Adirondack Park Agency, sponsor of these hearings, is not following the law in several crucial respects. These include the fact that APA has neither evaluated nor compared the four alternative ways to classify the Boreas Ponds tract, nor has it chosen at least one additional, reasonable alternative which has fewer environmental impacts than all the others: that being a classification alternative as Wilderness for all or most of the tract, necessitating the closure of all or most of the Gulf Brook Road to public motorized uses. Yet, the APA has chosen to present the public with an alternative (Alternative 1) which seems to present the greatest number of actual or potential environmental impacts to the Boreas Ponds and the land around the Ponds. Alternative 1 conflicts with the State Land Master Plan directive that the protection of natural resources be the paramount objective; while recreational uses are important they cannot be allowed to degrade those resources. Alternative 1 would likely allow or encourage such degradation. So, Alternative 1 should never have been included in the public hearing package at all. Alternative 1 divides the Boreas Ponds tract into half Wild Forest (10,000 acres approximately) and Wilderness (10,000-acres approximately). That seems reasonable until one looks at the map. The map depicting this alternative graphically reveals the negative impacts. It classifies the Gulf Brook Road as Wild Forest, open for public motorized uses right up to the Boreas Ponds Dam. It classifies the Ponds as Wild Forest. The Boreas Ponds themselves, the crown jewel of this tract, are proposed as the center of a mechanized zone and intensive recreational area. As proposed this alternative could conceivably permit car/truck parking at the Ponds, motor boating on the Ponds and competitive events at or on the Ponds. The former lodge site in a photo taken August 4, 2016 and provided by the Adirondack Council. Alternative 1 would allow the intensive use of the former Boreas Lodge site (now a grassy area, see photo at right taken in August) as a destination and gathering point for mechanized activity. The allowed uses are likely to pose unacceptable compromises to the ecological integrity and remote wilderness character of the Boreas Ponds. The waters and wetland resources, wildlife habitat and sensitive habitat, the awesome stillness of the Ponds would be threatened by all manner of disturbance by machines. The proposed uses also make a Wilderness classification beyond the Ponds highly impractical from a management standpoint. Wilderness managers are trained to protect and manage users and resources comprehensively, not according to multiple recreational zones. In short, Alternative 1 encourages the public to motor up to and around the Boreas Ponds, which will immediately introduce invasive species; fragments the Forest Preserve into small recreational zones; makes Wilderness management beyond the Ponds impractical, and erodes the contrast value between a motorized Boreas Ponds and the High Peaks and Dix Wilderness to the north. This isn’t a reasonable alternative which seeks to avoid or minimize environmental impacts. Alternative 1 also violates accepted Wilderness Management Principles. The NYS DEC has long endorsed basic principles of wild lands management which mimic those of the international textbook Wilderness Management (2009). Most of these principles are regularly recited in DEC Unit Management Plans. Alternative 1 violates all dozen principles, but for brevity I will limit a review to how it violates just the first three. Principle 1: Manage Wilderness as the Most Pristine on the Environmental Modification Spectrum. In short, this principle states that a fundamental objective of wilderness is to maintain its distinctive qualities that contrast wilderness from other types of land uses, and not to impose on a wilderness setting recreational demands which would erode those distinctive qualities. By proposing motorized and mechanized uses up to and circumnavigating the Ponds at the very center of the tract, Alternative 1 erases all of the distinctive wilderness qualities east of the Gulf Brook Road, including lands up to the existing High Peaks Wilderness boundary. Principle 2: Manage Wilderness Comprehensively, not as Separate Parts. This principle states that wilderness is a resource in and of itself by virtue of its cultural values and ecosystem services. Therefore, wilderness management must focus on wilderness as a whole or in its entirety, not on its separate component parts (vegetation, water, wildlife, geology, topography, recreational resources, etc.). In severe violation of this principle, Alternative 1 will impose vastly different management for purposes of separate recreational zones. The motorized proposal is flawed in part because the Four Corners to the Boreas Ponds corridor must have one type of management, the Ponds another, the Inner Loop yet another, and the Outer Loop still another. This is a textbook example of what should not happen on a wild lands tract – wilderness management emphasizing separate component parts which make overall comprehensive management virtually impossible. Again for emphasis, Alternative 1 takes no account whatsoever of any wilderness parts or values other than recreational ones. Principle 3: Manage Wilderness under a concept of nondegradation. In brief, this principle calls for maintaining existing wilderness and environmental conditions if they equal or exceed minimum standards, and for restoring conditions that are below minimum standards. If a wilderness area exceeds minimum standards, it should be managed to maintain those higher standards and not be allowed to degrade below them. In this case, it has been well documented that the Boreas Ponds tract greatly exceeds minimum wilderness standards in terms of degrees of naturalness and opportunities for solitude. However, Alternative 1 allows much more intensive, year-round public motorized and mechanized uses on and around the Ponds that were ever experienced during the occasional, light, periodic uses under Finch’s ownership. If classified and managed as proposed, the tract’s physical, social, psychological and biological resources will be degraded well beneath current conditions. Of equal importance, the opportunity for restoration to enhance the wilderness character of the heart of the property would be lost. State Land Master Plan Classification Guidelines: As stated in a memo by the APA’s (former) State Land Chairman Richard Booth (June 29, 2016), the State Land Master Plan creates a very strong presumption in favor of a Wilderness, Primitive or Canoe classification “for any new, large acreage Forest Preserve acquisition that contains special resource values.” The Master Plan purposefully narrows the choices available to the agency in these cases. The Boreas Ponds tract is a classic case in point. Those who have had the privilege to visit the Boreas Ponds over the last few years, including Governor Andrew Cuomo, have experienced these views and this set of intangible values very directly and personally. Thanks to the state’s actions and use of the Environmental Protection Fund, now the public at large is doing so. Most who visit or even see images of the Boreas Ponds agree that the State Land Master Plan’s language and classification determinants clearly argue for a Wilderness classification for much of this awesome lake-mountain landscape nestled against the High Peaks Wilderness. Further, the Wilderness proposed in Alternative 1 would be significantly fragmented, diminished and compromised by the mechanized zones inside and alongside them. Future management by Rangers of exterior Wilderness so tightly constrained and bounded by mechanized zones at their very center would be impractical at best, and virtually impossible to enforce. 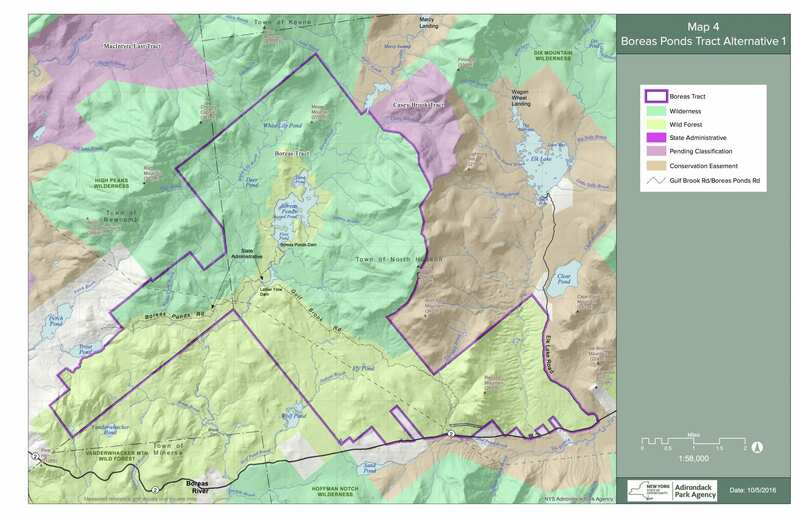 The ecological and integrity of the High Peaks Wilderness would be compromised by these mechanized zones centered at Boreas Ponds, not enhanced. Adirondack Wild is calling on the APA to follow the law, include a full Wilderness alternative which means closure of all or most of the Gulf Brook Road to public motorized uses, and to carefully evaluate all the alternatives with respect to how they impact the environment of Boreas Ponds tract. We appreciate the continued civility at the hearings, and the respect accorded all speakers and points of view. 01/24/16 What Should Guide APA Nominations?